Sun? Shade? Coleus likes both! Find out how to get the foliage look you want. Most of the coleus (Solenostemon hybrids) plants you find at your garden center look best with sun nearly all day. These are the newer varieties that have been propagated by cuttings. The seed-grown varieties are more shade-tolerant — you’ll usually find these plants in flats with the bedding annuals or in 4-inch pots, mixed in with the other container annuals. No matter which you choose, all plants can have color variation depending on maturity, fertilizer, temperature and light. 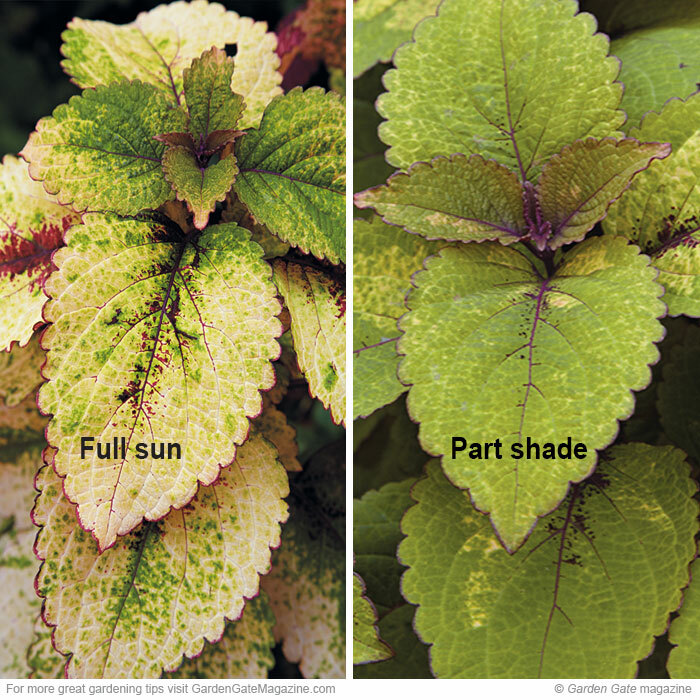 For the most part, coleus with red and orange leaves tolerate all-day full sun. Too much sun can cause purple-black ones to fade all over or they may scald (have pale burn spots on leaves). And for any color, too much shade can keep all the colors from coming out. To get a taste of just how much plants can vary, check out the two photos of Honey Crisp (‘Balconisp’) to the left. They were grown in containers about 20 feet apart. The only difference? One was in full sun; the other, part shade.